I've come to learn that each Rodrigo Amado record is going to be exciting and a challenge. With his out Motion Trio added by Chicago trombonist, Jeb Bishop, Amado delivers another fun and energetic performance that keeps the ear attuned. The Flame Alphabet is the quartet's first studio album, following their live debut, Burning Live At Ao Centro. You would think that in the studio the vibe would be contained and little less vibrant. You would be sorely mistaken. The sound is still bold with lots of urgency. 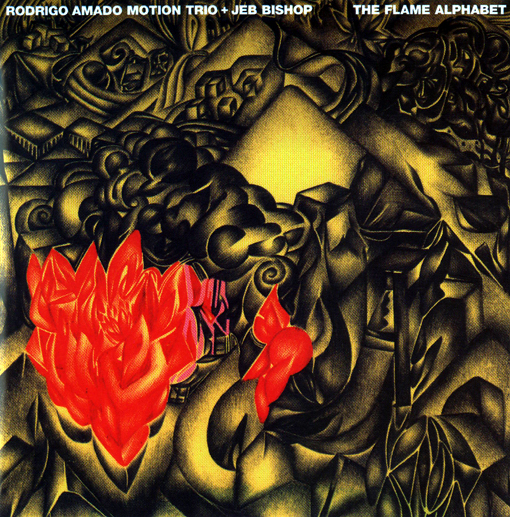 "Burning Mountain" and "Flame Alphabet" both have Amado in fine form. Tearing into notes and undulating patterns like a reincarnated Archie Shepp. Bishop flexibility allows for great interaction between both Amado and Ferrandini which makes for some excellent concentration on the listeners end. But it is extremely rewarding. "Into The Valley" is a scaled back piece. Amado's horn is sparse, while the rest of group revolves around a small series of improvised tones. This all comes crashing against fierce lines delivered by Mira and Ferrandini as the track moves forward. "The Healing" closes the album with grace. A ballad the drifts gently on the waves of Amado's notes. But Bishop provides a tones that almost feels like a trumpet. Rodrigo Amado's new ensemble is a spot-on quartet that delivers with every note. Detailed, intricate, electrifying and inventive from beginning to end. The Flame Alphabet is an album that you will come back to--again and again.